Untangle the complexities of supersymmetry Trying to understand supersymmetry but find your brain spinning out of control? 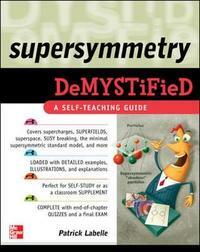 Supersymmetry Demystified is your solution! 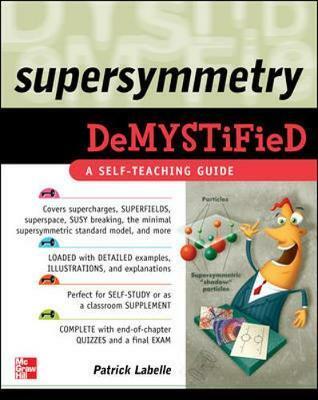 The Demystified format is the perfect way to clarify the incredibly complex topic of supersymmetry--a key tool in most cutting-edge research in particle physics, including superstring theory. The book uses a unique, intuitive approach to introduce difficult concepts, building on them as the chapters progress. Hundreds of worked equations and examples make it easy to understand the material, and end-of-chapter quizzes and a final exam reinforce learning. Patrick Labelle has a PhD in theoretical physics from Cornell University and held a postdoctoral position for two years at McGill University. He has been teaching physics at the college level for twelve years at Bishop's University and Champlain Regional College in Sherbrooke, Quebec. Dr. Labelle spent summers doing research both at the Centre Europeen de Recherches Nucleaires (CERN) in Geneva, home of the Large Hadron Collider, and at Fermilab, the world's second largest particle accelerator near Chicago. He has published a dozen papers in particle physics and has participated in the French translation of Brian Greene's The Elegant Universe (in the role of technical adviser).